‹ Diabetes and Children Symptoms – Mis-diagnosed? Diabetes and Children – You Are What You Eat! Diabetes and Children – Is Diabetes Self-Inflicted? The Purpose, Is Prevention: Before the US commercialized food industry, diabetes was a minute disease in our society. The reason for the sharp increase in the US population being diagnosed with Type 1 and Type 2 diabetes is the food you buy at the local grocery stores and feed to your loving family. This food is produced with chemical white flour, white sugar and HFCS chemicals, your kids are eating themselves into a self-inflicted illness. Poison additives in your food? Read More Here. Investigate the possibility of introducing more vitamins vs a insulin only treatment. The many medical and health benefits are well established and combined with a good diet can prevent diabtetes. 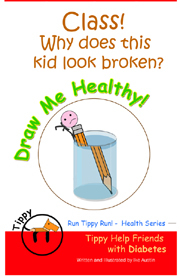 Run Tippy Run – Draw Me Healthy is a small start for you and your family. Parents can purchase the book direct from the publisher $6.50. About those beautiful TV commercials always showing kids having lots of fun eating lots of brand name, tasty fast food and drinking white liquid sugar sweet chemical filled sodas?